The 5.7 MW Outback solar project in Oregon proved to be a bit of a puzzle, though the pieces were very successfully put together by a number of different parties, including project owner Constellation Energy and EPC provider Belectric. The 5.7 megawatt Outback photovoltaic solar project in Lake County, Oregon, was a lot like putting together a puzzle, with various pieces snapping into place over time. Constellation Energy's investment in the project was a key piece of the puzzle that helped take the project across the finish line. Oregon is not within the prime solar irradiation zone of the American Southwest, but the fact that the Outback Solar project is located in a desert area on the east side of the Cascade Mountains did make it attractive for solar power production. Technologies Dura-Track HZ system. Also included are six SMA Sunny Central, 750CP, 825 kWac Max inverters. The economics were favorable for a tracking versus a fixed array system even though tracking systems have historically been considerably more expensive. "We're starting to see that the cost of tracking systems is becoming more and more attractive," says Brendon Quinlivan, director of solar sales at Constellation Energy. 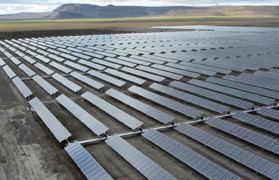 A company that can implement a tracking system in a cost-effective manner can more fully optimize the production of a solar power system, he added. Whether to choose a tracking system relates back to the power purchase agreement (PPA), where the goal is to maximize power production. It comes down to the project owner conducting a cost-benefit analysis to determine if the 15 to 25 percent extra power production typically gained from investing in a tracking system is worthwhile, based on how much extra income is gained under the terms of the PPA. The Outback solar project is a good example of the hard work, perseverance, and networking that often leads to successful renewable energy projects. Quinlivan says that the solar power industry in the U.S. is in many ways a community, where many individual players often make contributions by offering their expertise to fulfill a piece or two of an overall project. Typically, a project will involve a local developer working with the community to take it to the point of construction, a strategic investor, a strategic engineering, procurement, and construction partner, and a power purchaser. He adds that the industry continues to mature, and many of the players who have served it over the years also continue to develop. Through collaboration and the expertise they bring to the table, many more projects are completed. Past associations on previous projects also matter when it comes to evaluating the potential of new projects. Taking the time upfront to develop appropriate partnerships—in what can seem like onerous contract negotiations—can pay off down the road because it becomes easier to collaborate on projects, as well as repeat the process. Constellation Energy is developing projects both directly and through third party development channels, as was the case on the Outback solar project. The project moved ahead quickly once Constellation purchased it—only six months from the beginning of their involvement to its commercial operation date. "We enjoy working with our third party development partners, which affords us the opportunity to step into the opportunities when more of the uncertainties have already been resolved," says Quinlivan. Mike Grenier, managing partner with renewable energy project developer Smart Energy Capital, describes the Outback project as "undoubtedly one of the more sophisticated solar projects in the country." Quinlivan agrees that it did involve a few more key players along the way. "This project certainly had a few more players than other projects," he says. "We had a few other hands here, but all those hands were very necessary to ensure the project's success." The Outback solar project fit well with Constellation Energy's plan to drive its renewable business westward, and it continues to pursue opportunities in states like Arizona, California, and Oregon where solar deployments have proven viable in the past. Constellation Energy develops projects both directly and through third party development channels, as was the case on the Outback solar project. It certainly is an environmental success. According to U.S. EPA data, if the same amount of electricity being generated by the Outback solar project were generated using non-renewable fuels, it would result in the release of about 2250 metric tons of carbon dioxide annually, or the equivalent emissions from about 379 vehicles. Grenier adds that support from Oregon's network of solar advocates helped to bring about the successful completion of the project. Obsidian Finance Group started work on the Solar Outback project about four years ago, to acquire permits and the state tax credit. It also initiated work with the local power company and the Bonneville Power Administration's (BPA) transmission system. Smart Energy Capital arranged financing, secured the transmission rights, incentive agreements, and the engineering and construction contract. It also negotiated a 25-year PPA with Portland General Electric. Smart Energy Capital, which had previously worked with Constellation on development projects throughout the U.S., suggested to Constellation that the Outback Solar installation would be a good strategic investment fit. Before Constellation acquired the project, Belectric Inc. provided engineering, procurement, construction services, and construction financing and will continue to operate and maintain the installation, which has fully-automated, remote control, operational capabilities. 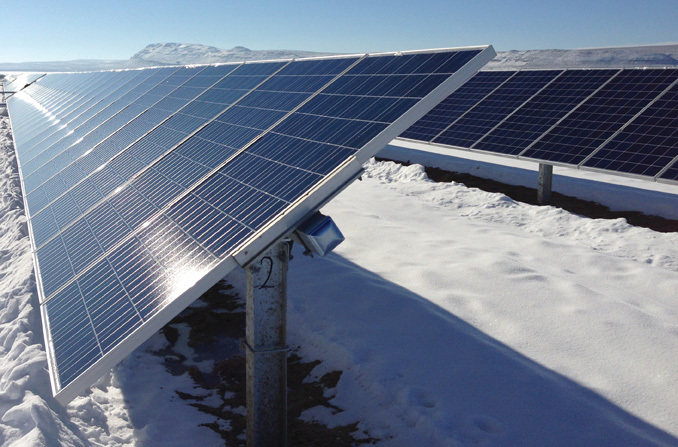 "In terms of project hardware, it was exciting for Belectric because it was the first project we've done in the U.S. using a single axis tracking system," says James Vance, internal project developer with Belectric on the Outback solar project. "It worked out great, and this experience adds to our repertoire." An interesting technical aspect of the project is Belectric's ability to remotely curtail power production from the installation—in megawatt increments—should a curtailment order be issued by transmission system operator BPA. Belectric has worked with Constellation on several large solar power projects and continues to operate and maintain several of those installations as well. Vance says their collaborations with Constellation have been very positive experiences. The Outback solar project fit well with Constellation's plan to drive its renewable business westward, and it continues to pursue opportunities in states like Arizona, California, and Oregon where solar deployments have proven viable in the past. Quinlivan says the duration of the PPA is always important, as the developer wants to ensure that it is long enough to recoup its investment over time. The power company benefits because it is purchasing the power from Constellation at a negotiated price over a long duration. It also counts toward the utility's requirement to meet Oregon's renewable portfolio standard (RPS) requirements without having to make any capital investment. For Oregon's three largest utilities, Portland General Electric, PacifiCorp, and Eugene Water and Electric Board, the RPS started at five percent in 2011 and increases to 15 percent in 2015, 20 percent in 2020, and 25 percent in 2025. Quinlivan says Constellation's business plan to capitalize on solar is definitely to seek long term PPAs like the one with Portland General Electric, or on a direct basis with companies like spice manufacturer, McCormick & Company, headquartered in Maryland. In that instance, Constellation financed, designed, constructed, and owns a rooftop solar power installation at McCormick's Hunt Valley Spice Mill & Distribution Center in Hunt Valley, Maryland. Consisting of 2,100 SolarWorld 175 watt, crystalline solar panels and 92,000 square feet of lightweight, flexible thin-film photovoltaic material, the system generates approximately one megawatt of electricity, or the equivalent of energy consumed by 110 homes per year. An important consideration for advancing Oregon's Outback solar installation was financial support, provided by a $5 million grant from the Energy Trust of Oregon and a business energy tax credit from the Oregon Department of Energy. Quinlivan says that the project's geographical location and the tax credits offered by the state made the project "very successful" in economic terms for Constellation. "They [Oregon] have been one of the front runners in providing funding for the deployment of renewable energy projects," says Quinlivan, with the Business Energy Tax Credit program, which has been available since 2006. The Outback project was developed at a point where the program has already seen some significant success, he added. The Outback solar construction project provided jobs for 75 people, many employed by electrical contractor Christenson Electric. One of the main construction challenges was to achieve commercial production within a specific deadline so that the project met grant qualification criteria. "The project was actually delivered in about a 10 to 12 week period, which was exceptionally impressive across a six megawatt deployment," says Quinlivan. Exelon Corporation, Constellation currently owns or operates more than 141 megawatts of solar installations that have been completed or are under construction, providing power to both commercial and government customers throughout the U.S. Between 45 and 50 megawatts are sold directly to utilities under PPAs with facilities owned and operated by Constellation.